The company of Majolikafabrik W. Schiller & Sohn was founded two years after the death of Friedrich Vincent Meinulph Gerbing, who together with Schiller had owned the company of ⇒Schiller & Gerbing. At first Schiller had tried to work together with the widow Karoline Gerbing, but in 1850 finally decided it would be better to leave, so he moved to the nearby town of Obergrund. His son Eduard Schiller joined as partner and continued on his own after the death of his father. With the beginning of WWI, the Schiller family closed the factory because most workers were called in for military duty; the factory was not reopened after the war. It is often claimed that the company of Schiller & Sohn had a business relationship with the Isleworth Pottery in England, but as already mentioned on the ⇒Schiller & Gerbing page, those claims are pure nonsense. 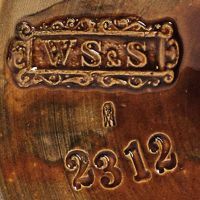 Used between 1850 and 1914, 'W.S.&S.' for Wilhelm Schiller & Sohn on a fully decorated item. 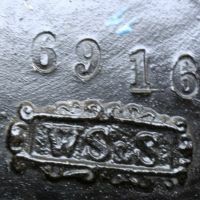 Used between 1850 and 1914, 'W.S.&S.' on a mainly white item. 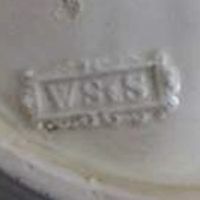 Used between 1850 and 1914, 'W.S.&S.' on the bse of a dark grey item. Used between 1850 and 1914, 'W.S.&S. 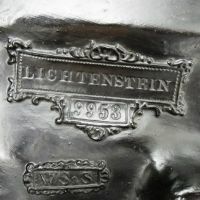 ', here accompanied by the item name 'LICHTENSTEIN'.